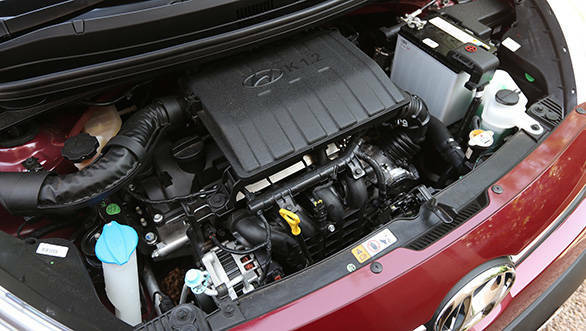 If there's one thing that Hyundai does exceedingly well, it is adding value to its products. Value in terms of equipment, design and the feel good factor. And that's something none of its competitors are currently able to match. Hyundai has also been hitting the sweet spot in terms of pricing with every new product it rolls out. 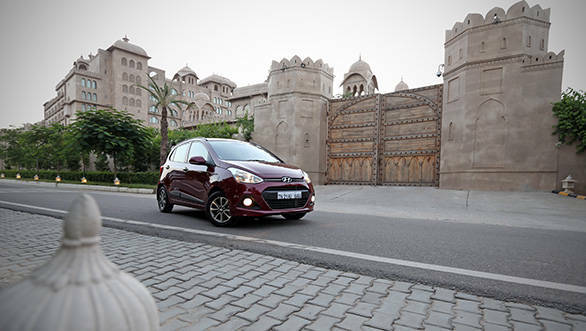 And it has done it again with the Grand i10. The Grand is essentially the next generation i10, but in India it will be sold alongside the current i10. The new car is longer, wider and roomier than the current car. It also looks more upmarket and younger than the car it was designed to replace. We love the sculpted bumper, the alloy wheel design, and its stance, which with the roof rails and the roof mounted rear spoiler, gives it a sporty aura. But, it's the interior of the car that truly impresses. The design is less chic and more grown up; it's almost like Hyundai decided to dump youthfulness for elegance. It looks pleasing and inviting. The quality compared to the current i10 has improved significantly too. The quality of plastic, its look and feel, and the fit and finish across the dash as well on the door panels, the floor console and even door handles is now right up there with the class benchmark. What's noteworthy is the attention to detail on the Grand. The various touch points like the steering, the gear shifter, and the various buttons and knobs like those for the power windows and the steering mounted controls, are all well finished and feel nice to the touch. All the controls have a positive feel to their operation too, and are logically placed. The only thing that needs work is the driver seat height adjuster; with the door closed there just isn't any room to work the handle. The Grand is also one of the better equipped cars in its class. In the Asta trim that we are driving a multifunctional steering wheel, rear AC vents, a cooled glovebox and a stereo with 1GB internal storage and Bluetooth telephony is standard. As are power ORVMs with auto fold. And there's keyless entry and start too. The only car that comes close to the Grand in terms of equipment is the Nissan Micra. And there's more to the Grand's interior. For a car that measures around 3.7 metres, it is surprisingly roomy. There's enough and more room at the front, be it for the head, elbows or for stretching the legs. Even at the rear, the head room impresses, as does the kneeroom. This car can easily seat two six footers front and back. The shoulder room though decent, will still be a squeeze for three average built Indians. The seats are comfortable and the ones at the front are large and supportive, and great for long drives. 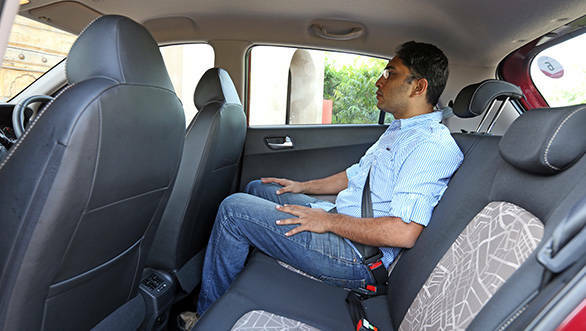 The rear seats have large and comfortable squabs too and the fixed seat back angle is well thought out as well. We would have, nonetheless, liked better thigh support here. In fact, comfort in one area where the Grand could do with some improvement. Besides the rear seat thigh support, the ride quality of the Grand could have been better too. As is typical of Hyundai cars, the Grand is setup on the softer side and as a result the low speed ride is good. It's quiet and absorbent. However, load up the car, pick up speed and hit a bump or a pothole, and the car tends to crash into these irregularities. It's not jarring but the occupants can both hear and feel the hit, and it's not very pleasant. Handling has never been a Hyundai forte, at least in India. And that hasn't changed too dramatically with the Grand. 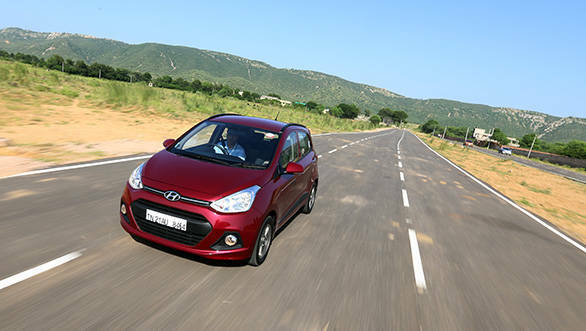 The new car feels more planted than the current i10, no doubt; the undulations are dealt with less body movement and drama, it rolls and pitches less under sudden direction changes, and it feels more confident under braking. But, the fact is, it still has ground to cover compared to its competitors when it comes to dynamics. Moreover, even though the Grand runs on larger wheels compared to the i10, the grip levels still aren't great. Having a light and mute steering doesn't help here either, and all of this doesn't bode very well on the highway. However, in the city, the Grand is brilliant. The same light steering along with a light clutch, precise and easy gear shift action, and well judged servo assist for the brakes makes it effortless to drive in the city. 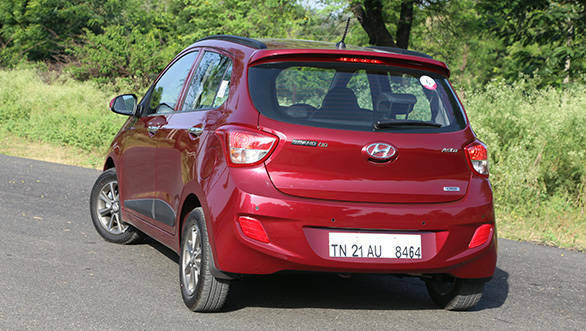 Also, Hyundai has reworked the steering compared to the current i10. So, the Grand's unit is quicker and less vague, and that helps instil more confidence in the car's abilities. 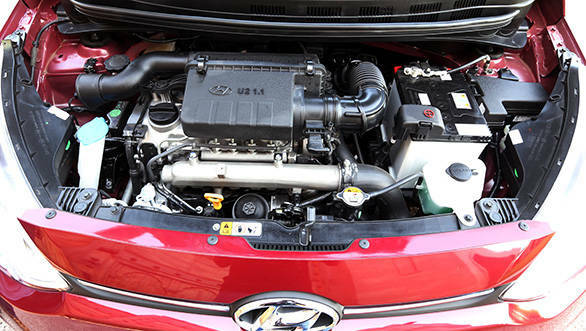 The Grand i10 is available with two engine options - a 1.1-litre diesel and the tried and tested 1.2-litre kappa 2 petrol. We drove both, but preferred the petrol for its overall ability. The diesel is smooth and efficient. It also has good low and mid range grunt, but get past 3500rpm, and there's a very clear drop in the pull. So much so, that one doesn't like revving the engine past this mark. This leaves the car with a small optimum operating range. Again, in the city, the diesel feels more than adequate, but on the highway, driving the diesel Grand i10 can be a chore, especially when overtaking. The petrol instantly feels a lot better - one has more revs to play with, the car pulls well all the way to its 6000rpm plus redline, and though the engine noise increases towards the top, it never sounds harsh or overtly stressed. 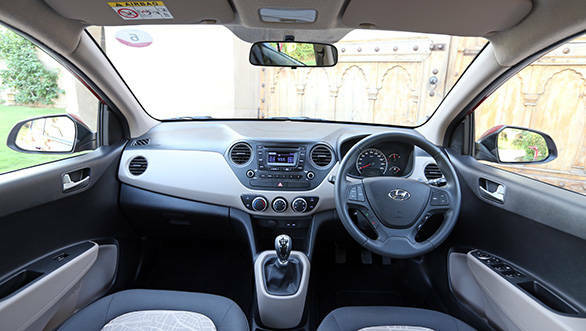 But the fact is, whether you choose the petrol or the diesel variant, in this top of the line Asta trim, the Grand i10 makes for a great buy.